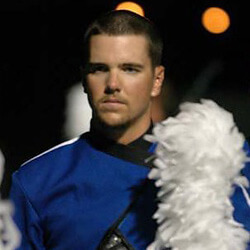 David Reaver, 18 University of California Riverside Pacific Crest 2007-2009, Blue Devils Trumpet 2010 How did you choose your corps? I chose Pacific Crest because many of my friends from high school were members of the corps, and they convinced me to audition. Pacific Crest is also close to my home so travel costs and time were greatly reduced. I chose the Blue Devils because many of my instructors and good friends performed with the corps, and I felt the Blue Devils attitude and style was right down my alley. What was the experience like the first time you auditioned for a corps? I was 14 when I first auditioned, so I was almost sure I was not going to make the cut. I decided I would throw my best out there anyway, and I worked very hard on the audition material. I found that I had greatly underestimated my abilities and prior training because I made lead trumpet. The lesson to be learned is that auditions are not only a test of talent; they are also designed to find who wants a spot the most. Measuring the preparedness of each individual on the audition material is a sure sign of someone's desire to march. Corps not only want talent, they also want individuals who have strong character and work ethic. That is what really pulls a corps through the last weeks of the summer. What's the best way to prepare for an audition? Many auditionees focus simply on being able to get through an exercise without breaking or cracking, and do not pay attention to the purpose behind each portion of the audition material. Each exercise is designed to portray a certain aspect of one's playing. In this era of drum corps, most people have great chops and can get through every exercise, but few can do so with a mature quality of sound or a mature approach to the instrument. You can tell a lot about a musician through a b-flat scale or a measure of flam accents. In short, strive to master each exercise, not simply get through the audition packet. If a corps does not have a packet, then focus on things that set you out from the crowd like presence, sound, and confidence (especially in visual auditions). What would you say to someone who is unsure whether or not to audition for a drum corps? Many people audition just for the experience, even if they plan on not marching that year. If you want to march in the distant future, almost any corps will be happy to let you audition because they want to help you get better. If you simply think you won't make it, you are essentially cutting yourself. The worst way to not make a corps is to not try, and when the summer hits, you will probably feel like you missed out on a great opportunity. Just go for it! Any other advice? One of the biggest things instructors look for is improvement between auditions. Don't think that because you got a callback you can slack off, because everyone else who got a callback would love your spot. Secondly, since auditioning costs time (and usually money), you might as well make it a point to learn as much as you possibly can. It is hard to put a price on experience, but what you learn at a weekend of drum corps can be invaluable in the future, even if you do not make the corps. Lastly, it is really important to remember that humility goes a very long way in this activity. Do not try to make excuses if an instructor gives you a correction, never express any negativity toward anyone else who is auditioning, and do not make a scene if you do not make it. Your ambition and desire to make the corps should be communicated through your performance qualities, not your mouth. The summers that are the most fun are the ones where you make the most friends and create the most memories. This requires you to keep a check on your ego, and understand that you are auditioning to become a part of a team. Having a great character and humble attitude will get you far, if not get you in. Learn more about corps audition dates, locations and additional info.